Dhaka – Prime Minister Sheikh Hasina has said both quarrel and diplomatic ties will remain with Pakistan, which was defeated during Bangladesh’s 1971 war of liberation. The Prime Minister came up with the remarks at a press conference organized on her recently-concluded trip to Canada and United States. She stated that the trip was successful. Hasina said it is very natural that Pakistan, being a defeated force in Bangladesh’s liberation war, would not find comfortable that their people are tried for war crimes. “They will do their job and we will do ours. We are trying the war criminals. But that will not necessarily require cut of diplomatic ties with the country,” Hasina told reporters to a question. To another question on efficacy of South Asian Association for Regional Cooperation, Hasina said that the charter of the SAARC could be reviewed for its more effectiveness. “I can’t alone take decision. And it will not be well to make any comment on this matter now,” Hasina said. Referring to India-Pakistan tension over Kashmir, Hasina said the two South Asian countries need to resolve their problems bilaterally. “We don’t want their tension destabilize the entire region. War on Pakistan and India will definitely have impact on us. Therefore we want they resolve their problems amicably,” Hasina said. In response to a query regarding Pakistan’s latest response to execution of a war criminal, the premier said: “Pakistan is a defeated force. “This little row is nothing that big. 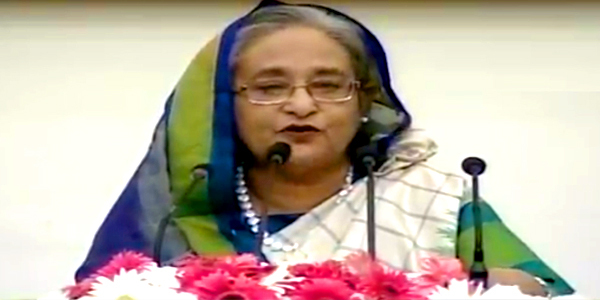 Our ties will continue and protests as well if they make such statements,” Prime Minister Hasina said.